Tax season isn’t the only time of year your small business should be concerned with tracking and organizing tax deductions. You should be keeping up with receipts, refund charges and inventory but there may be come deductions you didn’t realize you could claim. Whether your small business makes cash donations or non-monetary donations, hang onto the receipts as you may be able to claim a large portion of those donations on your taxes. Making a donation to Goodwill in the form of clothing or making a cash donation to the local charity can give you a tax break. Let’s say business is good and it’s time to move to a bigger location. Any moving expenses associated with getting to the new location could be tax deductible. From the moving trucks to the hired help, it can all be a write-off for you. If you run a small business that requires employees to take part in training or re-certifications and your company pays for those classes, you can use the receipts for the educational purposes as a tax write-off. Even if you are self-employed and required to maintain your own license through annual classes, you can write those off as well. For example, a Realtor is responsible for keeping his educational requirements up to date so they are able to write those classes off. If new equipment is needed to maintain business operations, save the receipts, those purchases can be tax deductions. Whether you are buying new computers, manufacturing equipment or even cell phones for field agents you have employed; it is all a write-off. Just about any piece of equipment that is needed to run the business can save you money through tax deductions. Typically you’ll choose whether you want the full amount claimed or you have the option of spreading it over a few years for a larger tax break. Business checks are also a good form of payment and tracking. Yes, even your marketing materials are tax deductible. Just about anything you use to market or advertise your company should be considered a write-off so keep all receipts, printed materials to the services you use to promote those materials. Other marketing aspects that could be a write-off would be television commercials you run, flyer distribution services and even events you host to promote your company. Many small business owners don’t realize the many other tax deductions available to them. Some of the most commonly overlooked deductions are things like postage, business gifts, bank fees, commissions, office supplies, beverage services for the office, consultant fees and even the online services you use to maintain your operations. These are all items that get overlooked during tax time but that can save you a lot of money each year. If you have an accountant for your business, he or she should keep up with all of the tax deductions available to you and advise you on which receipts to keep track of for that purpose. Even if you use an online accounting and tax program, it should advise you on deductions that you might be able to claim. 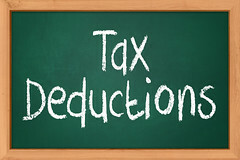 Tax deductions help you lower the amount of taxes due every year. They can also save you a lot of money. These are the main tax deductions that you may not know you can claim. Should your small business rent or buy? Marlon Green is a tax professional based in Austin, Texas that specializes in small business accounting and tax preparation.